I have the best Clean Eating einkorn flour recipes from my blog right here all in one place. Good Einkorn flour recipes are hard to find, especially if you want them to be Clean. Many einkorn flour recipes are not Clean, because they contain regular sugar. You won’t find those on here! You can’t just substitute other sweeteners straight across for sugar, so you can’t just change those recipes around. That’s why you need these tried and tested Clean Eating einkorn flour recipes. 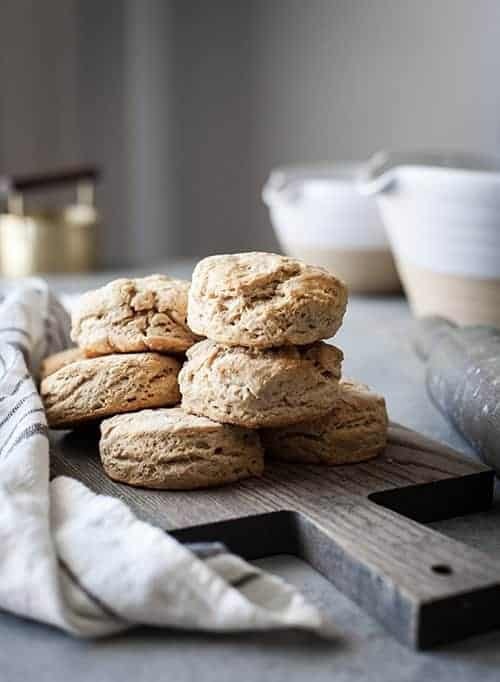 No substitutions needed and no trial and error needed with these Clean Eating Einkorn Flour Recipes. Einkorn flour acts somewhat like any wheat flour. The main difference is the amount of gluten in einkorn flour is less than what is in regular wheat flour. Because Einkorn flour has less gluten, the flour to water ratio is not the same. Einkorn flour needs more soaking time in the water and less kneading. Personally, I love this flour. I love cooking with it, I love the flavor and I feel the best after eating it. Give it a try! Einkorn is an ancient grain that has been around since before the Neolithic Era. It is considered to be the first wheat man harvested over 10,000 years ago. After some time, einkorn was discarded, as other hybridized grains became more popular to harvest. Einkorn is thought to be more difficult to mass produce because it produces less than the average modern wheat seen today. The modern wheat grains are bigger than einkorn grains and the coverings are easier to separate from the grain than it is for einkorn. This makes modern wheat better for mass production, while einkorn has to undertake an extra step in the milling process, making mass production more difficult. Although einkorn was left in the background, for quite some time, it is beginning to be popular once again. It is mostly being grown and cultivated in Europe. It has been brought back for its nutritious qualities and ease of growing in difficult conditions. Einkorn is also considered to a pure wheat that hasn’t been manipulated for mass production like modern wheat. What are the benefits of Einkorn flour? Einkorn is considered to be a good alternative to whole wheat, for people suffering from celiac intolerance. While einkorn does contain gluten, it’s gliadin to glutenin ratio is much lower than the modern wheat used in bread. Gliadin is the main cause of the immune response caused in the intestines. A lower ratio of gliadin to glutenin means that someone with celiac intolerance could most likely tolerate this flour. It does contain a small amount of gluten, however, and may not be good for those with celiac disease. Being a more nutritious alternative to the gluten-free diet isn’t the only reason to try out einkorn flour. This ancient wheat has higher levels of protein, essential fatty acids, vitamin B6, riboflavin, potassium, beta-carotene, lutein and phosphorous than modern wheat. It has thirty-five more times vitamin A than what is found in modern wheat. Vitamin A improves health in the eyes and reproductive organs and helps to prevent cancers. The riboflavin found in einkorn is used to create energy and help to slow the aging process. Lutein, which helps to prevent cataracts in the eyes and macular degeneration, is four times as much in einkorn than in modern wheat. Beta-carotene is an immunity booster which helps to prevent cancer and heart disease. Einkorn’s carotenoid levels are better retained through the baking process, unlike other kinds of wheat that are baked. Einkorn also retains its high antioxidant values through any baking or cooking process. If that isn’t enough, it has a high level of protein, phosphorus, vitamin B6 and potassium to boost the health of the body. What foods can you substitute einkorn flour in? Einkorn flour acts pretty much just like any modern wheat flour. The only difference is the amount of gluten found in einkorn is less than what is in wheat. Because einkorn flour doesn’t have as much gluten, it doesn’t require the same flour to water ratio, it needs a longer time to soak in the water and less amount of kneading. Einkorn flour could also be used for pancakes, muffins, brownies and more. Einkorn flour has a richer taste and will be a great substitute in any recipe that calls for flour. Want to learn more about einkorn flour or buy it? Here are some links that might help out. Is einkorn flour good for you? This ancient wheat has higher levels of protein, essential fatty acids, vitamin B6, riboflavin, potassium, beta-carotene, lutein and phosphorous than modern wheat. Is einkorn flour gluten free? Is einkorn and farrow the same? Farro is an Italian word. It encompasses three varieties of heirloom grains: spelt, emmer and einkorn wheat. They are referred to respectively as farro grande, farro medio and farro piccolo. Spelt is an ancient grain which is a distant cousin to wheat. It hasn’t been hybridized like wheat. Although spelt is closely related to modern-day wheat. Wheat became more popular and unfortunately spelt has been mostly forgotten. Einkorn pasta is pasta which has been made with Einkorn wheat. Can I substitute einkorn flour for all-purpose flour?